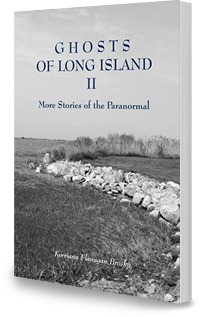 After the success of author/photographer Kerriann Flanagan Brosky’s first book about the paranormal (Ghosts of Long Island, 2006), and the multitude of new Long Island connections that were forged therein, the clear choice for Ms. Brosky was to write a sequel. Determined to avoid the stereotypical Hollywood ghoul factor of many “true ghost books,” Ms. Brosky’s exploration of the paranormal of Long Island takes a more spiritual approach. The ghosts investigated for this project exist in a variety of structures—from modest homes to magnificent mansions to old schoolhouses to a bar where the “spirits” sliding across the counter aren’t only in glasses. The emphasis is on a connection between the present and the past. Ms. Brosky and her investigating companion Joe Giaquinto, a paranormal expert, followed a string of connections from Elmont to the East End. They were invited into people’s homes, businesses and a multitude of historical structures, where intriguing tales would emerge along with occasional goose bumps. From the sudden loss of a young adult who continues to visit his family, to wandering ancient souls who have remained in their eighteenth-century homes since passing, the ghosts in this book are presented in all their fascinating variety. Accompanying the many experiences explained by local residents are humorous or sometimes eerie anecdotes as when Kerriann and Joe conduct an interview in a house that never contained a music box, and a mysterious chiming, unrelated to anyone’s cell phone, occurs. Ms. Brosky also makes a point of incorporating Long Island history, as well as paranormal explanations gathered from her extensive research. The reader of Ghosts of Long Island II is invited into a world that exists right here—in your neighbor’s house, or your friend’s, or your favorite restaurant. It is a world often tossed aside by skeptics, or often denied by those lucky enough to catch a glimpse. Nonetheless, it is a spiritual and intelligent exploration into the realm of the afterlife, that has sparked human interest for centuries, and that are specifically intriguing in a culture as rich and historic as that of Long Island. Can’t get enough Ghosts of Long Island? Check out these videos.